Description: This coniferous tree is 30–80' tall at maturity, and the trunk of a mature tree is ¾–2' across and straight. The crown of this tree is narrowly conical and relatively open, while the trunk below the crown is naked for about one-third to two-thirds of the tree's length as a result of self-pruning. The primary branches, originating from the trunk, are slightly ascending above, widely spreading in the middle, and slightly drooping below. There are also shorter twigs that originate from the primary branches. Outer trunk bark of older trees is gray and somewhat scaly, while outer trunk bark of young trees is gray and smooth. The outer bark of larger branches is gray and relatively smooth, while twigs are brown, grayish brown, or reddish brown. 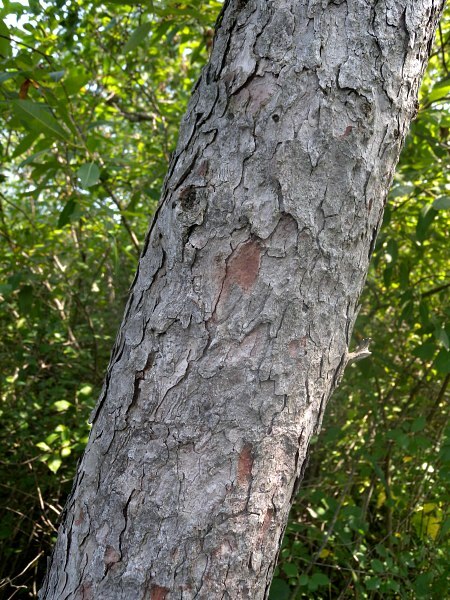 When the outer bark breaks away on the trunk and larger branches, patches of reddish inner bark may become visible. Tufts of 10-20 needle-like leaves develop on short spur-shoots (about 3 mm. long) of the twigs. These leaves are ¾–1" (2–2.5 cm.) long, about 0.5 mm. across, light to medium green, linear in shape, hairless, and deciduous; they become yellow during autumn before they fall to the ground. Because Tamarack (Larix laricina) is monoecious, both male flowers and female flowers develop on the same tree. The male flowers develop from the tips of twigs, where they resemble clusters of yellow buds. The female flowers develop near the spur-shoots of twigs on short curved peduncles (up to 5 mm. long); they develop on immature scaly cones that are reddish purple and less than ½" (12 mm.) in length. The flowers are cross-pollinated by the wind during early to mid-spring. Afterwards, the female cones continue to develop, becoming mature during the late summer or early autumn of the second year. Mature cones are ½–¾" (12–20 mm.) long, broadly ovoid in shape, and brown to reddish brown. Each cone has 10-20 spirally arranged scales that are overlapping. The scales are ovate-orbicular in shape and either smooth, slightly undulate, or slightly lacerated along their upper margins. At the base of scale, there are 2 winged seeds. The seed body is about 2-3 mm. in length, while its wing is about 4-6 mm. long. The winged seeds are distributed by the wind. The woody root system is very shallow (up to 2' deep) and widely spreading. This tree reproduces primarily by reseeding itself, although it can also reproduce by layering when its lower branches touch moist ground. Cultivation: The preference is full sun, wet conditions (but not flooded), an acidic peaty soil, and cool climate. However, moist sites with more mineral-rich soil are tolerated as well. This tree can be propagated from either seeds or cuttings. It can live for about 150-200 years (rarely longer), and seed cones may be produced in as little as 15-30 years. Range & Habitat: The native Tamarack (Larix laricina) is rare, occurring only in the NE corner of the state; it is state-listed as 'threatened' (see Distribution Map). Illinois lies along the southern range-limit of this tree; it is more common further to the north. Tamarack occurs primarily in the Great Lakes region, northeastern United States, and boreal areas of Canada. The primary habitat consists of forested or shrubby bogs where sphagnum mosses are often present on the ground. Less commonly, Tamarack occurs in less acidic wetlands, such as forested fens. In forested bogs, Tamarack is often codominant with Black Spruce (Picea mariana). Because of its shallow roots and thin bark, this tree is easily damaged by wildfires. In Illinois, it is found in high quality natural areas. 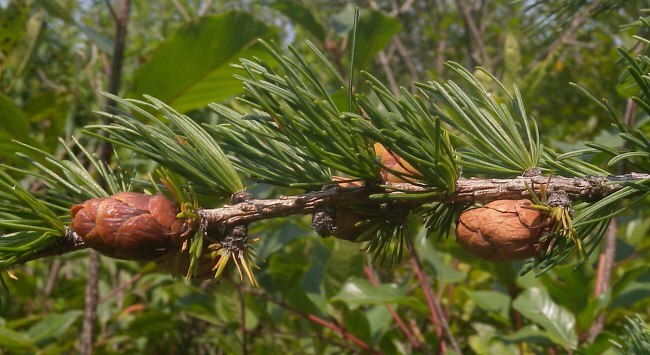 Faunal Associations: Many insects feed on the needle-like leaves, wood, roots, and other parts of Tamarack (Larix laricina) and other larches (Larix spp.). These insect feeders include woolly conifer aphids (Adelges spp. ), giant conifer aphids (Cinara spp. ), plant bugs (Miridae), adults of some spittlebugs (Aphrophora spp. ), larvae of Pristiphora erichsonii (Larch Sawfly), larvae of Urocerus albicornis (White-horned Horntail), larvae of various long-horned beetles and bark beetles (Cerambycidae, Scolytidae), and larvae of Coleophora laricella (Larch Casebearer Moth), Tolype laricis (Larch Lappet Moth), and other moths. Another insect that is found on Tamarack is the Larch Tree Cricket (Oecanthus laricis). See the Insect Table for a more complete listing of these species. Vertebrate animals also use larches as a source of food and for other purposes. The seeds of Tamarack are eaten by the Red Crossbill, Pine Siskin, and other birds (see the Bird Table for more information). Some birds, like the Blue Jay, Bald Eagle, and Osprey, use larches as nesting sites (DeGraaf, 2002; Uchytil, 1991). The seeds of this tree are also eaten by the Red Squirrel, mice, voles, and shrews (Uchytil, 1991). White-tailed Deer feed sparingly on the twigs and young shoots, while the Porcupine feeds on the inner bark. Photographic Location: Volo Bog in Lake County, Illinois. Comments: Tamarack (Larix laricina) is one of the few trees that flourishes in bogs. Because this tree has a relatively open crown that produces only light shade, shrubs are usually abundant in Tamarack-dominated bogs. Tamarack is unusual for a coniferous tree because it sheds its leaves, becoming leafless during the winter. This reduces its ability to provide protective cover for wildlife during the winter. A similar species, Larix decidua (European Larch), is cultivated as a landscape plant, although this is rather uncommon. It has been known to escape from cultivation and naturalize in Illinois on rare occasions. This latter tree can be distinguished from Tamarack by its longer seed cones (¾–1½" in length) that have more numerous scales; these scales are hairy when they are young. The leaves of this tree are also slightly longer in length (up to 1¼"), and it adapts to drier situations. There are additional larch species (Larix spp.) in western North America, but they also have larger seed cones with more numerous scales. 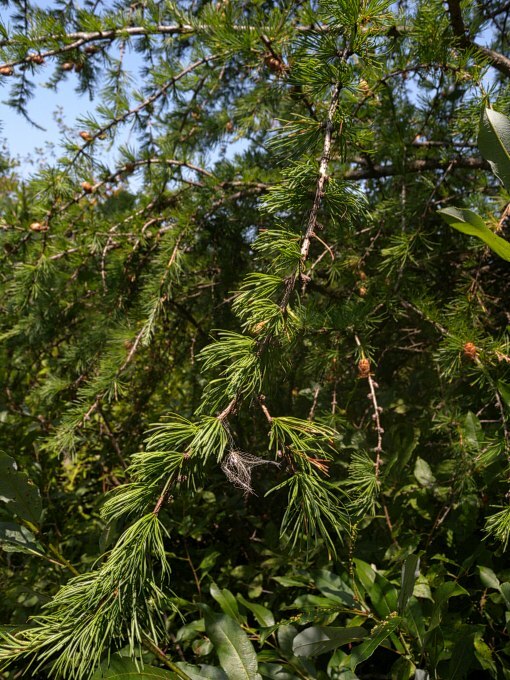 Another common name of Larix laricina is American Larch.